Audrey lives on Dartmoor in Devon. 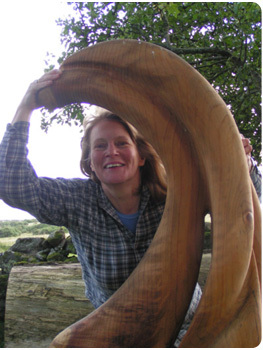 She sculpts mainly in naturally felled english hardwoods. She is inspired by her environment - the wild nature of the rugged moor, with its ever changing landscape and echoes of prehistoric culture. Audrey works without drawings, carving the wood directly. "From gnarled bog oak to the swirling colours of magical yew, the wood I choose to work has elemental character imprinted within. I see myself as releasing the imprisoned forms." Audrey carves sculptural pieces for inside and outside. The outside work is made from durable hardwood and designed to last in all weathers. She is happy to undertake commisions.